We have begun adding histories of those companies who worked in the Walking Picture business, and these are listed in the site menu bar under Walkie Companies. The idea is to list as many as we can to provide a resource for researchers, family history compilers, etc. Through our own research and with the help of collectors we have now identified over 200 such firms. Many of them came and went quite quickly, however few names carried on business for many years. Barkers for example established themselves in 1927 and were still active in the 1980s. Wrates, in Skegness, began around 1920 and only stopped taking walkies in the 1970s (and are still in business, albeit now doing school portraits and commercial work). 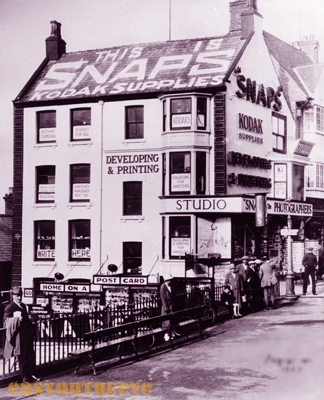 Snaps, in Bridlington, opened for business in 1927 and only closed in the sixties. Sunbeam operated out of Margate and were astonishingly busy for many years, shooting an estimated 35,000 Walking Pictures on a busy Bank Holiday in the thirties, with their photographers each covering a specific area of the sea-front. The forthcoming book Go Home On A Postcard will carry details of some of the important firms.